Drop us an e-mail and we get you up to date! Paradise grain and tail peppercorns are the two most special ingredients of the Bombay Sapphire gin. With the other ingredients, these botanical additions are hung in the kettle, in a basket. 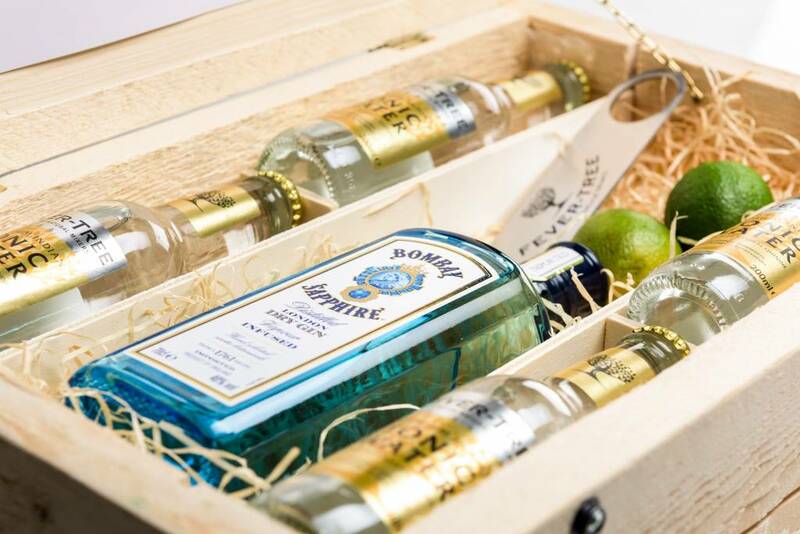 The powerful herbs mix with the distillate, which makes Bombay Sapphire a passionate gin. Fever Tree Indian tonic can also be found in the package. This tonic is known as the only 100% natural tonic, made from spring water, cane sugar and pure quinine. The taste of the herbs in Bombay Sapphire gin is called subtle, the color of the bottle is not at all. The sapphire blue bottle of Bombay Sapphire is not only a feast for the eyes, it is also very striking. Together with the tonic and lime you can make a Bombay Sapphire gin tonic, which you really have to taste. Are you a lover, then we recommend this beautiful package. 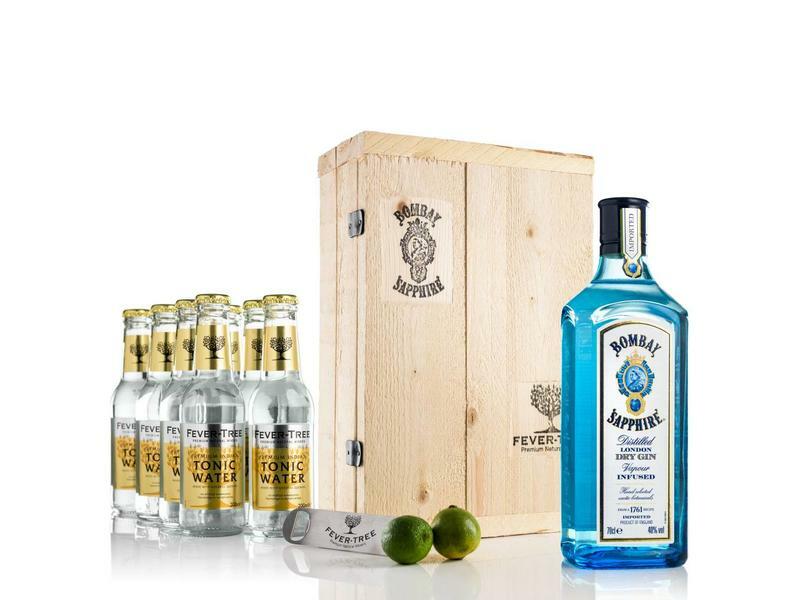 We also have other packages in our range with the blue Bombay Sapphire gin bottles. Take a look at our product page. 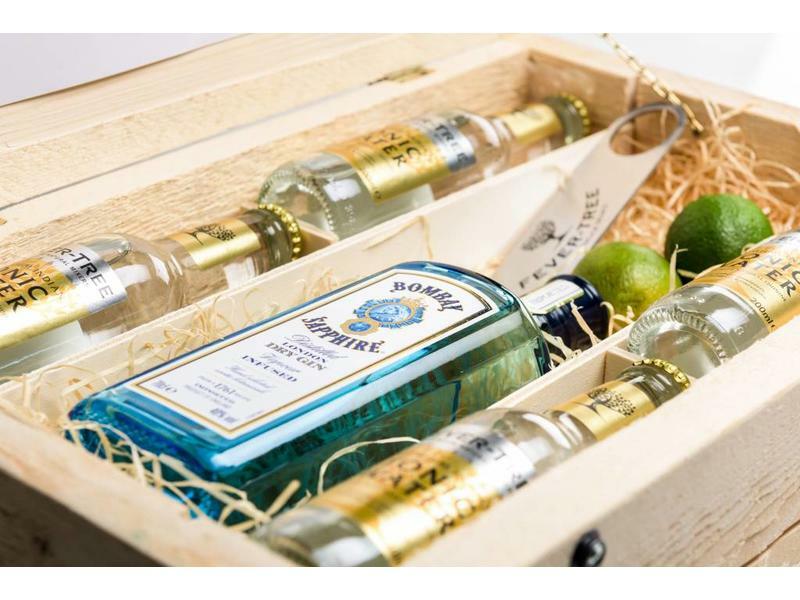 The handmade wooden boxes from gintonicgift.nl are very suitable for putting together original promotional gifts. 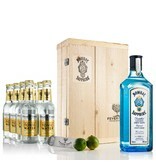 We have a number of standard packages in our assortment, of which Bombay Sapphire Gin is one of them. 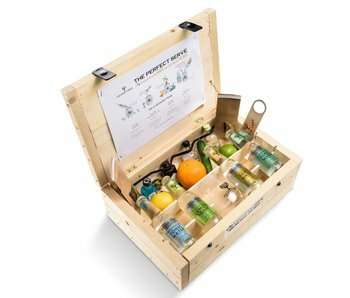 This handmade wooden box containing a composition of 4 different mini gin bottles and 4 different Fever-Tree flavors. 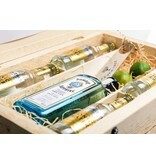 The box also contains garnish to finish the perfect serve and a glass. 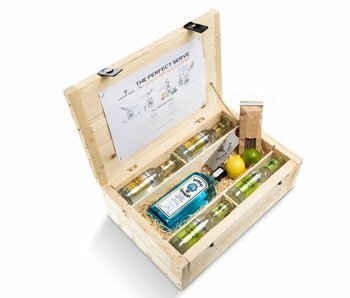 This box consists of a handmade wooden box containing a composition of a 0.7L bottle of Bobby's Gin and 8 bottles of Fever-Tree Indian tonic. 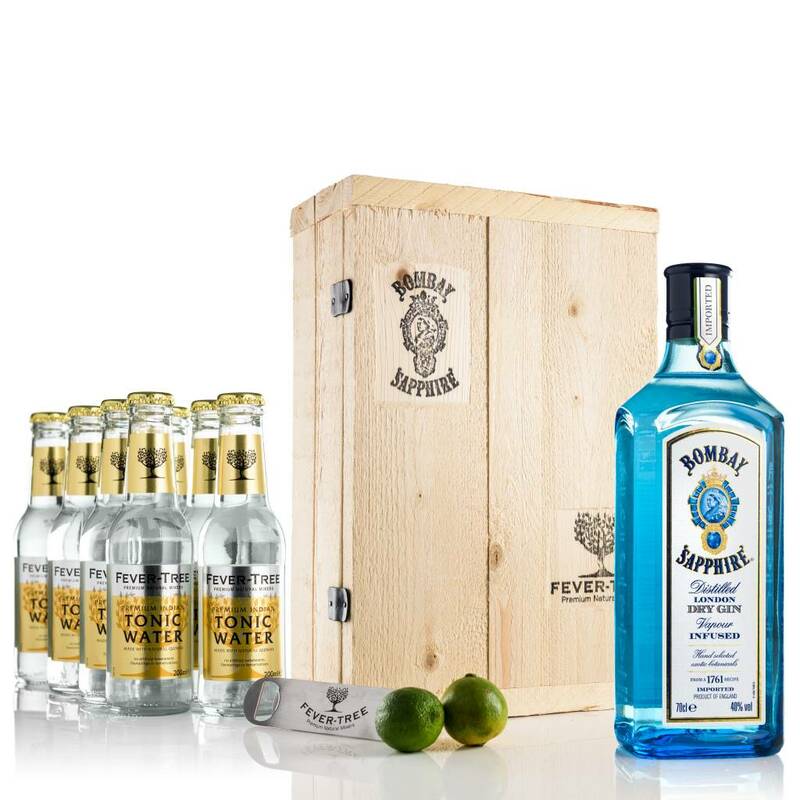 The box also contains an opener and garnish to finish the perfect serve. 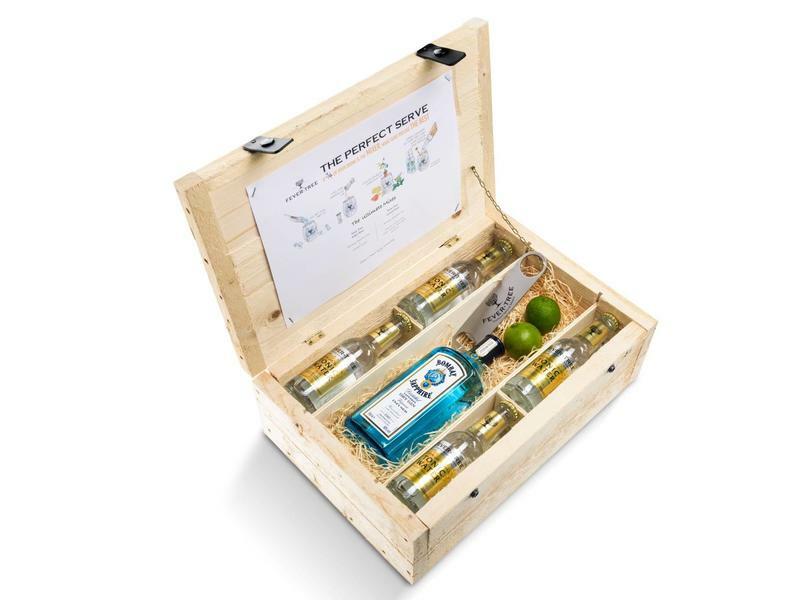 Beautiful handmade boxes filled with the finest premium gins and tonic. 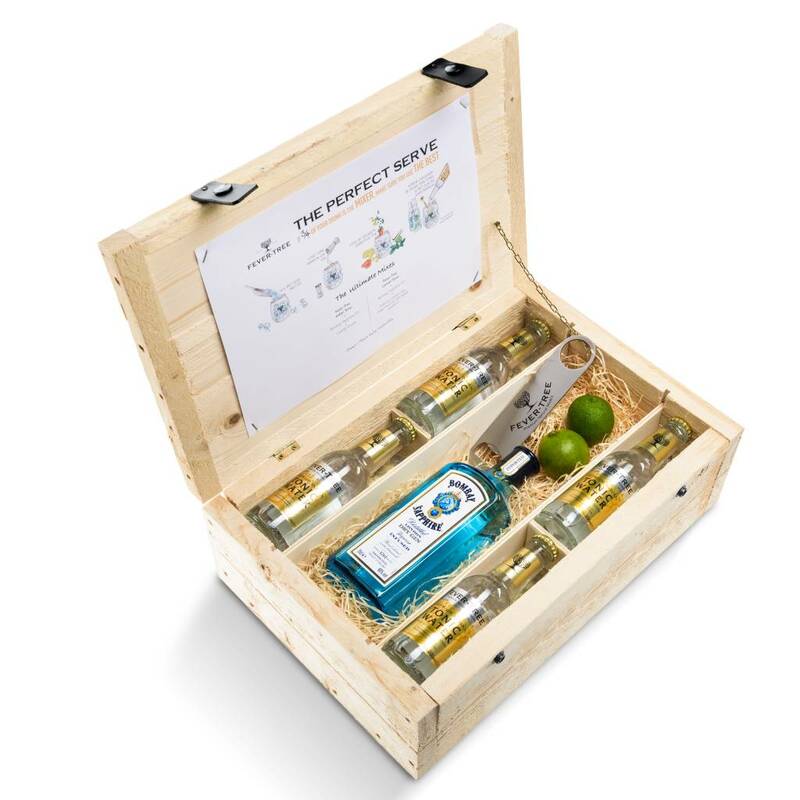 Let friends and Gin Tonic discover our miniature gift packs.